Belgian soldiers patrol in central Brussels as police search area during a continued high level of security following the recent deadly Paris attacks, Belgium, Nov. 23, 2015. Schools and the subway system remained closed Tuesday as Brussels, Belgium remained under tight security while authorities tried to find the key suspect in the November 13 Paris attacks. Belgium's Prime Minister Charles Michel said Monday that because serious threats still exist the capital will be on the highest state of alert until at least next week. But he said the country wants to return to normal and that on Wednesday kids would go back to school and the trains in Brussels will be running. Suspected Paris attacker Salah Abdeslam evaded a massive manhunt Sunday night involving raids in Brussels and its suburbs, but security forces Monday were also focusing on towns in eastern Belgium, suggesting police fear Europe’s most wanted man might be trying to flee to neighboring Germany. On the third day of an unprecedented lockdown of the Belgian capital, officials here remain tight-lipped about the biggest security operation mounted in the country since World War II. On Sunday night, 16 suspects were arrested in more than 19 raids in Brussels and outlying towns to the east and south of Belgium’s capital, which is also home to the main European Union institutions. One of the suspects, who was not named, has been charged in connection with the Paris attacks while 15 others were released. Belgian security officials admitted to VOA they don't believe they have yet rolled up a terror network they say is planning to mount more attacks similar to those that struck Paris November 13 and left 130 people dead and more than 350 injured. Belgian media outlets said police arrested four people late Saturday, one possibly wearing a suicide belt. But Geert Schoorens of the federal prosecutor’s office said later he could “neither deny nor confirm” the reports. Authorities addressing reporters Monday did not reference those reports. Belgian soldiers patrol in central Brussels as police searched the area during a continued high level of security following the recent deadly Paris attacks, Belgium, Nov. 23, 2015. Meanwhile, Moroccan authorities say Belgium has formally requested help in tracking a key suspect in the Paris massacres, as Brussels remains on lockdown and police there press forward with a massive search for terror suspects. A statement from Rabat said Belgium's King Philippe asked Moroccan King Mohammed for close and intense cooperation in the hunt for Salah Abdeslam, who has avoided arrest since crossing into Belgium from Paris hours after the November 13 attacks. A Moroccan tip last week helped lead French police to an apartment in north Paris where another suspect, massacre architect Abdelhamid Abaaoud, was killed in a November 18 raid. Elsewhere, police in the southern Paris suburb of Montrouge on Monday were analyzing an apparent suicide explosives belt found in a trash bin. A French police official quoted by the Associated Press said preliminary analysis of the vest, which lacked a detonator, showed traces of TATP, an explosive used in the Paris attacks. The belt, containing bolts, was found in the same area as a cell phone belonging to the fugitive Abdeslam, who was seen in the area the night of the attacks. Late Monday, the U.S. State Department issued a worldwide travel alert, warning Americans that Islamic State extremists and other terror organizations continue planning attacks "in multiple regions." The advisory cited recent attacks in Denmark, France, Mali, Nigeria and Turkey, and urged "particular caution" during the upcoming holiday season. Earlier Monday, Belgian prosecutors announced the arrests of 16 suspects who had been detained in 19 raids late Sunday in and near Brussels, which is also the headquarters of the European Union. Five more arrests were also announced Monday. Counter-terror units were active Monday in Liège, Belgium, apparently chasing tips that Abdeslam was spotted in a BMW there. Liege is less than a half hour's drive from the German border and close to the Belgian town of Verviers, where in January Belgian police units were involved in a gunfight with jihadists. A local media outlet reported that the 26-year-old Frenchman and former petty criminal managed to break through a police cordon near Liège, but officials refused to confirm or deny the claim. If true, the escape from police clutches near Liège would be the second time Abdeslam has been close to capture. Just hours after the Paris attacks, Abdeslam was stopped by French police near the border with Belgium in a car with two other men and was questioned but let go. At the time, his involvement in the attacks was not known, so there was no alert out on him. Belgian security sources told VOA they believe Abdeslam is receiving help from jihadist networks to evade capture, despite the fact that the fugitive told friends in Skype conversations, according to an ABC News report two days ago, that the Islamic State was unhappy with him after he failed to detonate his suicide vest. They said he was still desperate to get to IS territory in Syria. "Intensive border security measures are in place and have been since the Paris attacks," a German police spokesman told VOA. Already under a barrage of criticism in Belgium and overseas for intelligence fumbles leading up to the Paris attacks, the country’s counterterrorist agencies appear desperate to shore up confidence in their competence. But the failure to locate Abdeslam is adding to obvious public anxiety. Eric van der Sypt, Belgium’s public prosecutor, said at a news conference early Monday that a judge would review the detentions of the 16 people arrested on Sunday and a further four detained Saturday night. All the raids in Brussels and the towns Anderlecht and Charleroi were conducted without incident. But in the Brussels suburb of Molenbeek, where Abdeslam and several of the Paris attackers lived, a car drove directly at security forces, prompting police to open fire. The driver was injured. Speaking on Belgian television Sunday, Interior Minister Jan Jambon cautioned that the emergency would not be over if and when Abdeslam is found. "It is a threat that goes beyond just that one person," he said. "We're looking at more things. That's why we've put in place such a concentration of resources." Belgian prosecutors said Monday police in the capital city have arrested 16 terror suspects in 22 raids, but top Paris massacre suspect Salah Abdeslam still remains at large. Brussels' subway system and its schools are closed Monday as wary residents face a third day of lockdown and another work week overshadowed by the massive manhunt. As the country’s security services intensified their search for a network of Islamic militants believed to be planning a series of attacks on targets in Brussels, many workers stayed at home Monday and businesses closed. Soldiers patrolled streets in the center of Brussels and armored vehicles were deployed outside main stations and in major public spaces. 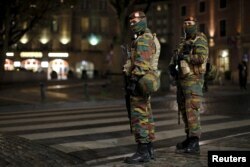 Authorities indicated at least two militants were at large in the Brussels area who "could commit very dangerous acts." Some security sources put the figure at closer to eight. Transport remained severely restricted, with the city’s metro system still suspended and schools shuttered. On Grand Place, the city’s historic central square normally full of tourists and locals, an armored vehicle was parked close to a Christmas tree. EU institutions were open Monday but with armed troops mounting patrols — many staff were working from home. NATO said its headquarters in the city were open, but some staff were also asked to work from home. Belgian authorities have urged the public and media not to comment on social media sites about any ongoing police operations they are observing, saying that tweets and Instagram photographs could tip off suspects. Following the lead of a Dutch cameraman, many Belgians have started instead to post pictures of their cats – a surreal expression of humor amid high public anxiety.